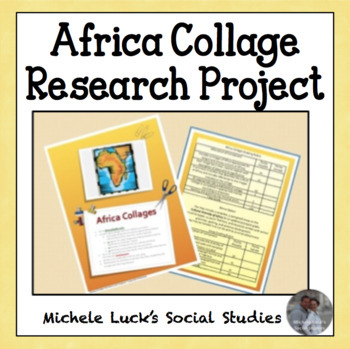 Start your investigation of Africa with this Africa Research & Collage Activity in your World History or World Geography class. This is a culminating project to assess student understanding of the physical and human geography of the Africa. Students are directed to complete the collage online using glogster, but the same assignment could be created by hand, if needed. 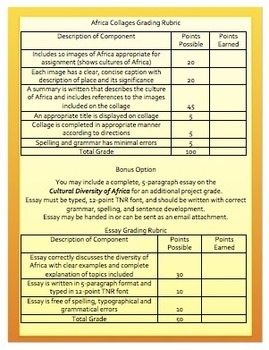 Assignment requires students to include images, captions, and a summary of the physical and human geography of Africa. An optional essay is also included where students can earn additional points for transferring their content understanding into a 5-paragraph essay format. A grading rubric is provided for students to assess their own work. 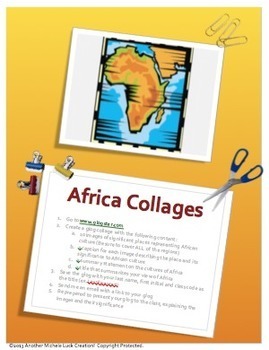 If you like this culminating assessment, see the Complete Unit on African Geography available at my Tpt Store! See my store for other great Social Studies lessons, activities, games, and so much more!